Yes, you heard right, I am a beekeeper. It all started one evening when Superman and I were at a March of Dimes fundraising gala. I saw a beekeeping kit up for silent auction. I went and put our number down to begin the bidding war. Well, it turned out not to be much of a war or battle or even a tug-of-war…but we “won” the prize! (What do you call it when you have the last bid on a silent auction item? A win? A pay out???) Anyway, in addition to the tallest table lamp ever (again we were the only bidders…hmmmm I see a trend here. Are Superman and I just so lucky or just have really bad different taste? ), we were the proud owners of a bee hive kit. In all honesty, this is a perfect idea for us. Superman has been planting fruit and nut trees down at the farm for a couple of years now and the bees will be beneficial to the trees and provide us some honey! I was so excited! I started researching the best books to buy, watching videos and trying to learn all I could about keeping bees. I bought these two books to get me started, Ashley English’s, Keeping Bees and the number one selling beekeeping book on Amazon The Bee Keeper’s Bible. Oh, I did lots of reading and watching, but I was still a bit reluctant to actually take the big step of buying bees. The following year, Superman and I went again to the March of Dimes fundraising gala and bought another bee hive kit. Everything I had read said that in order to be successful in keeping bees, you must have at least two hives (so you can compare the health of each hive) and to go to a class. I was ready. Superman said that this adventure would be all on me. Go for it. So I did. I looked online to see where I could take a local class. The Carolina Bee Company is the closest one, 45 minutes away in Travelers Rest,SC. Thomas was real excited about this bee stuff, so I signed the two of us up for the class. It was an 8 hour sit down lecture with a few breaks here and there. I found it extremely interesting. Thomas, on the other hand..zzzzzzzzz…..the entire time. Let’s just say he had a very expensive nap. The next day was the scheduled hands on outdoor class with actual bees. Unfortunately the weather made it quite iffy it was going to be held. At home, it was chilly and drizzly, so I assumed it was canceled. Nope! I check my email hours later and see it was held. Darn. But I didn’t let that deter me! I got the area at the farm ready for the bees. Sam and I painted the bee boxes. No, the boxes don’t have to white. I happened to have some leftover paint, so I used that. The important thing is that the boxes are sealed on the outside to protect them from weather. Also, it is important to only paint the outside and not the inside of the boxes, so the bees have an unadulterated place to build a colony and make honey. Did you know that the inside of a hive is completely sterile? The worker bees work hard to keep all debris out of the hive, including dead bees, dirt and intruders who’ve made it past the guards. Even if a small mouse were to sneak into the hive, the bees will kill it. But because it is too heavy for the bees to carry out of the hive, the bees encase it in propolis, a sticky glue like substance. The mouse will become entombed and the hive will remain sterile. We located an area that faced south to allow the bees to face the sun to keep warm even in the winter and that was sheltered by a wind break. Sam helped me and Thomas get the hive stands level. In the picture below, I have the boxes facing in opposite directions to help the bees accommodate their navigational systems. (But a few weeks later, I put them parallel to each other, so I could utilize the holes in the concrete blocks. I slipt 2 2X4’s in the holes to make a shelf where I can lay the boxes down as I check the hives without getting them dirty. As you know, honey is pretty sticky!) The hives are ready and the flowers are blooming….Bring On The Bees! The day finally arrived for me to pick up my bees! There are thousands of bees in each box. There were a few stragglers whom I got for free! Of course within 10 seconds of signing on the dotted line, I got stung. Yeah, it hurt for just a short minute then it went away. Honey bees are not dangerous! They are actually quite friendly. It is all about respect. When I went to pick up the boxes, I inadvertently pressed a bee. He was only protecting himself from impending death by being smooshed. Now I was going to have to drive close to an hour and a half from Travelers Rest to Gaffney with two boxes of bees in my enclosed car. I was a bit nervous. Although the bees were making quite the buzzing noise when I started the car, they calmed down when I turned up my Christian music. I made it to Gaffney just fine. But reality set in, when I discovered I didn’t have my bee veil! Oh brother! I wasn’t going to let that stop me. The bees had to be installed. I tucked my long pants into my wellies, put on one of Superman’s long sleeved shirts and my long leather gloves. I was covered, except for my face. Anyway, you take the box in both hands and firmly give it a strong knock downward. The bees will tumble out! Then you just tap tap tap the outside of the box shaking the bees in. Remember: Superman and I have NO bee suit or veil on and there are tens of thousands of bees flying all around and buzzing in the box! Aiy, yi, yi! Time to put the frames back in. There is a sense of urgency here, because not only did I want to get out of there, (Can I be honest? I felt a little uncomfortable since I had never done this before), I wanted to put the top on to secure them in. Here I am pouring thick sugar water into the feeding tray. Yes, the bees need to be fed! As they are building and establishing their new hive, the bees are using an incredible amount of energy. Do you see the rectangular space on the right side of the tray? It is covered with a screen. The bees can travel from the bottom box, up through that space and feed on the food, but not actually getting into the substance and drown. The sugar water seeps under that screen. We don’t need anyone getting all drunk and crazy on sugar syrup! The last thing to do is pop the top on and wait a week. And cross your fingers you did everything right The bees’ traveling RV’s rest with their doors open below the hive, so the laxidasical guys can find their way home. Knowing jobs of each of the bees, I have a feeling they are the drones. There is one queen for each hive. Her job is to lay thousands of eggs every day. The worker bees are female. They forage for food and pollen, build the wax cells for eggs or to fill with honey, cap the cells with wax, fan the cells with their wings to dehydrate the moisture out of the wax, regulate the temperature of the hive to a perfect 90 degree, protect the hive from intruders, feed and groom the queen. (You know..make the house a home, bring home the food, cook the food, clean the house, and basically manage the entire operation.) The drones are male. They are heavier and stockier than their female counterparts in the hive. So now guess what the drones only job is. Go ahead, guess….You got it! To follow the virgin queen out of the hive and mate with her. Huh. I’ll let you absorb this information. 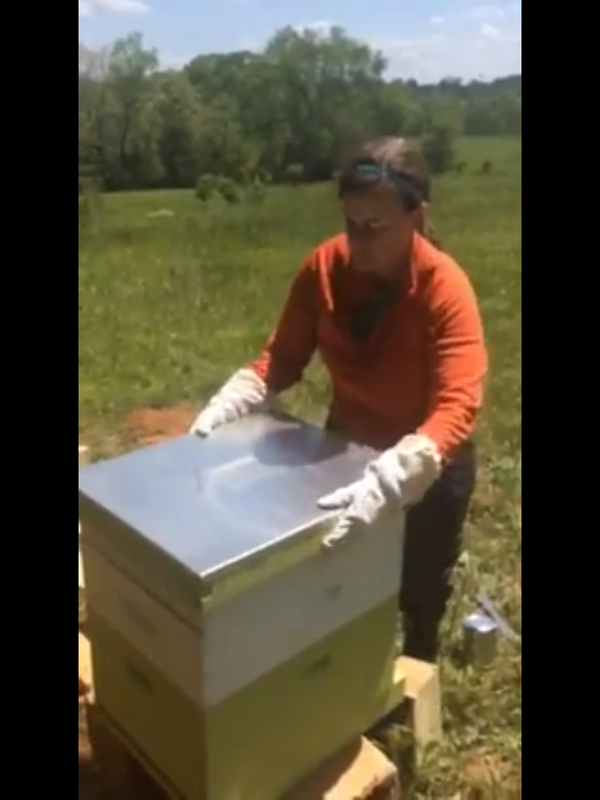 Here is the link to Video of me installing the bees into the second hive. Superman is credited with the videography. Thanks Babe for being there! With that said. Let me end this post with two thoughts. 1. God is so amazing in his design! How can anyone think this happened because of evolution or reincarnation or hocus locus? Only the One God of the universe created life, the stars, trees, humans and bees. 2. Finally, Girls Rock! I’m just sayin…Friends if I can install all those bees without a suit, what can YOU do?!? Thanks for dropping by! I can’t wait to take you along on this little bee keeping adventure of mine!